The 2007 DCI Division II Champions, Spartans of Nashua, N.H., are getting ready to defend their crown in Open Class this summer. Dan Potter hears how it's going from Spartans executive director Peter LaFlamme. 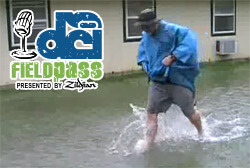 And, we find out how rain and flooding in central Indiana has affected the Blue Stars pre-season rehearsals – all in today's Field Pass presented by Zildjian.